The Vance Office closes for lunch daily from noon until 1:00 p.m.
Driver license and non-driver ID transactions cannot be processed at the Vance Office. Disclaimer: The information contained in this website is current as of July 1, 2017. 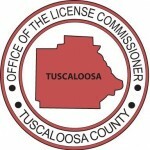 It is not all-inclusive, and is only meant to provide general information regarding licensing and registration requirements in Tuscaloosa County. Please note that changes in the law and directives from the Alabama Department of Revenue can alter, negate or compound the requirements contained herein.